The 2016 BSDB Autumn meeting, organised by Jenny Nichols and Tristan Rodriguez under the topic of ‘chimaeras and their use in studying developmental processes and disease models’, took place on 28-30 August in The Pollock Halls at the University of Edinburgh. It was sponsored by the Anne McLaren Memorial Trust Fund and The Company of Biologists. The five sessions on (1) Lineage tracing and Potency, (2) Signalling Mechanisms, (3) Regenerative Medicine and (4) Human Development, (5) Disease Models and Gene Function, saw a wide range of applications of chimaeras discussed in various model systems, presented as a mixture of traditional uses of chimaeras, recent innovations within this historical context and a broad range of other ideas and approaches – incorporating both the weird and the wonderful! A detailed meeting report will follow, and the speaker list can be viewed here. Chimaeras are made of cells from two or more different organisms of the same or different species. Since their first conception, chimaeras have been an essential tool to dissect cellular potential and are used to address a large number of questions in developmental biology using a variety of different model organisms, from plants to vertebrates. But they have also always been an inspiration for story tellers and other artists. It was therefore delightful to see artists exhibit on this topic on the conference. 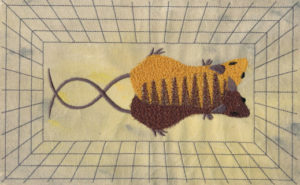 These artists were Mia Buehr, who showed computer-generated embroidery with developmental biology themes, such as chick embryos, early mouse embryos and chimaeras (LINK1, LINK2), and the jeweller Aurora Lombardo (LINK). Finally, the Autum Meeting hosted the inaugural Dennis Summerbell Lecture which was given by Iwo Kucinski who carried out his work in Eugenia Piddin’s laboratory at the Gurdon Institute. 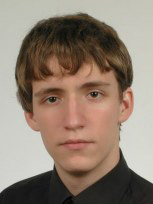 Iwo’s lecture was entitled “The molecular signature of the loser cell status reveals key pathways regulating cell competition” (for more detail see here). Overall, the meeting was a great success, paving the way towards the big BSCB/BSDB/Genetics Society Joint Spring Meeting (2-5 April 2017), for which registration is now open (LINK).